At the conclusion of a White House forum on criminal justice, Obama said he wanted to make a final point about the nexus of race and the criminal justice system before launching into his defense of the movement. 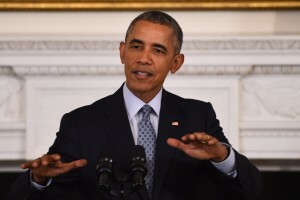 “I think everybody understands all lives matter,” Obama said. “I think the reason that the organizers used the phrase ‘Black Lives Matter’ was not because they were suggesting nobody else’s lives matter. Rather, what they were suggesting was there is a specific problem that’s happening in the African-American community that’s not happening in other communities. Police relations with minority communities and the deaths of unarmed black men have been topics of great interest since the shootings of 17-year-old Trayvon Martin in 2012 in Florida and 18-year-old Michael Brown in 2014 in Ferguson, Missouri. Those deaths, and others of black women, have inspired protests around the country under the “Black Lives Matter” moniker. Obama paired his defense of the Black Lives Matter movement with praise for police and other law enforcement officials. Some police groups have been unhappy with Obama’s response to the deaths of the unarmed black men. The president lately seems to be making the extra effort to publicly praise police officers for willingly taking on a dangerous assignment. He did so while participating in a forum on drug abuse Wednesday in Charleston, West Virginia, and next week he’s scheduled to address the International Association of Chiefs of Police. At the White House, Obama said there are specific concerns about whether blacks in certain areas are treated unfairly or are more frequently subjected to excessive force by police. He said people shouldn’t be “too sanctimonious” about situations that can sometimes be ambiguous. “It’s not just something being politicized. It’s real and there’s a history behind it and we have to take it seriously,” he said. In a separate development, the Black Lives Matter organization on Thursday rejected a town hall-style forum it had been offered by the Democratic National Committee, in lieu of a sanctioned debate it had requested. The group said a town hall wouldn’t “sufficiently respond to the concerns raised by our members.” The DNC said it has approved only six debates, and all have been scheduled.